For a garden that’s been pretty much ignored and neglected, mine has produced a substantial amount of food for my kitchen. All in spite of the frequent visits from Mr. Groundhog and the constant harassment from the neighbor’s bamboo. The latest offering from it consisted of green tomatoes and shelling beans. The beans weren’t actually shelling beans. They were overgrown green beans that I designated to use as shelling beans. The tomatoes, on the other hand, had reached the top of the bean trellis, which is 8 ft. tall. So I just wanted to hack the heck out of them, and came away with dozens of green tomatoes as a result. Aren’t they supposed to be done by now, anyway? The idea at first was to make chili verde out of the green tomatoes, a la this recipe from Southern Living, but the first batch had no takers. There’s a certain color of food that my family seems to stay away from. So, a second batch was made to include other colors, and this time, everybody partook in the meal. Good thing there was plenty of green tomatoes! 1. Heat 1 tbsp. of olive oil in a Dutch oven, over medium-high heat. Brown meat, in batches. Remove and set aside. 2. Sauté onion and garlic in the same Dutch oven, adding more oil if necessary, until translucent. 3. Add the rest of the vegetables, and continue cooking until vegetables are cooked. If using canned beans, add them later when chili is at the simmer stage. 4. Add chili powder, cumin, and oregano. Stir and cook for an additional 2-3 minutes. 5. Return meat to the pot. Add tomato sauce and broth, bring to a boil. Reduce heat to a simmer, and continue cooking, uncovered, stirring occasionally, until pork is tender, about 30-45 minutes. Add chopped cilantro prior to serving. This is good served over rice, topped with Green Tomato Salsa and queso fresco (or feta). Or you can serve this in a taco bowl. To make your own taco bowls, brush corn tortillas with olive oil, heat for 1-2 minutes in a sauté pan to make them more pliable, then place them over upturned muffin pan. Bake in 350° F for 8-10 minutes until slightly brown and crisp. 1. Finely dice all vegetables. 2. Mix all the vegetables in a bowl with lime juice, salt & pepper, and cilantro. 3. Cover and chill until ready to use. You do your garden justice! Love your pix and recipes, always. 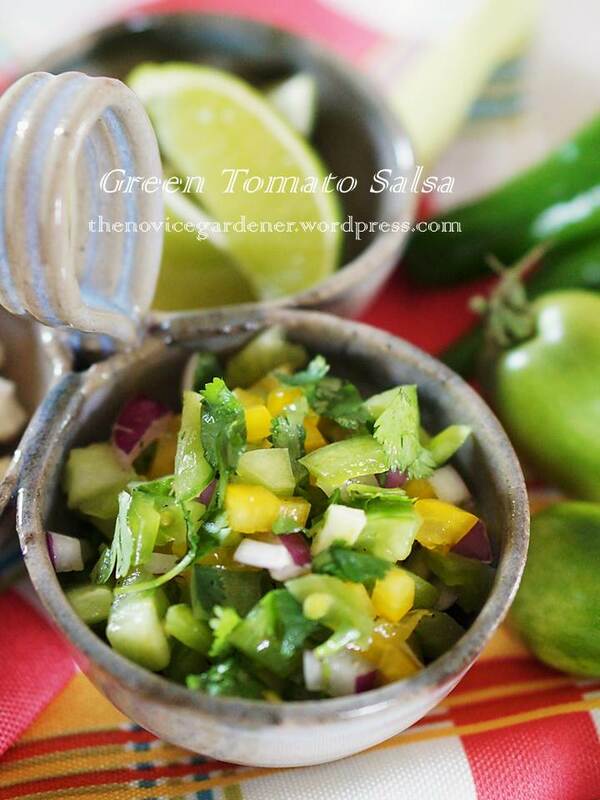 What a great idea, green tomato chili. Sort of like (or literally) a chili verde. I think tomatillos are used it that. Perfect end of summer, autumn warm-up food that looks– and must taste–so fresh. The little tortilla bowls are very clever. 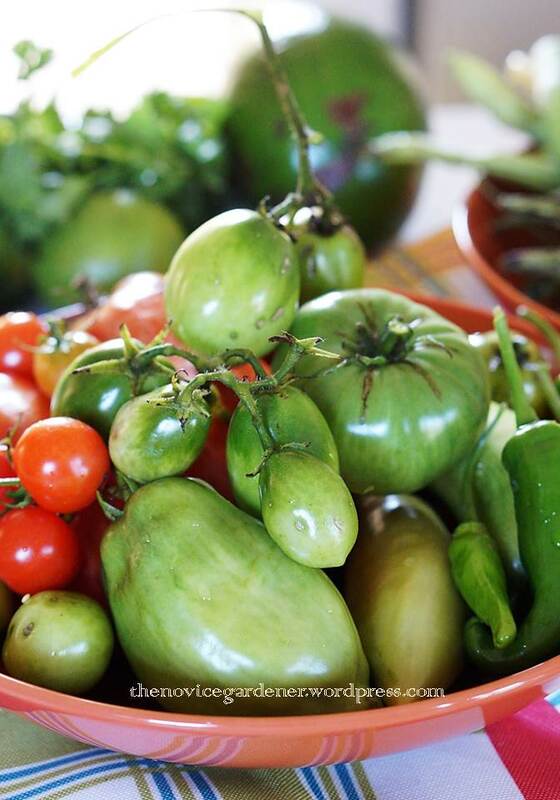 I have variously wrapped green tomatoes in newspaper to ripen over the course of the winter,(some spoil, some ripen and are delicious); pulled the plants out of the ground and hung them upside down to ripen in my garage; or just made lots of salsa with the green tomatoes at the end of the season. Also have done fried green tomatoes–somewhere I heard or read that in the Southern U.S. a variety of tomato that is green when ripe is used in fried green tomatoes. I always thought it was a way in which to use up all those season-end nonripened ones. Btw, I’ve made oven-fried green tomatoes and they turned out delicious. I think in the South they do make fried green tomatoes out of green (unripe) tomatoes, not just from a green tomato variety. Quite sure about it. I like the film “Green tomatoes” – it’s an old film but I will seeing it in future again and again. In Berlin there is blue sky and I will going to the University to study. Hi, Angie. My neighbor has a plethora of green tomatoes from her late-season garden. I am sending both of your green tomato recipes her way! 🙂 Oh, my, how I adore your blog! Btw, Pomegranate Hens are currently in the oven. You’re the first to get a preview of tonight’s dinner and post! Angie. Oh. My. Gosh. Roast hen with pomegranate? Are you using pomegranate molasses – or the seeds of the fruit? We are on our way to your house. Sure hope you made extras for unexpected Snu’s and Guy’s. 😉 Sounds so succulent! Oh, haha, you don’t need me to get you more followers! You do that all on your own! Enjoy your dinner. I will be checking your blog for that post – and looking for hen so I can copy you. 🙂 Take good care. Oh I wish I had had this recipe at the end of my tomato season!! Looks and sounds delicious!